Red with Colour China - 26 items found. Pretty little jug with moulded body and ornate handle. Backstamp:Fruit Basket English Ironstone Franciscan Made in England (made for Franciscan by Masons) Excellent condition. Small octagonal jug with hydra handle and with a fabulous lustre glaze. Backstamp: Mason's Patent Ironstone China Fruit Basket England Guaranteed Detergent Proof & Acid Resisting Colours. Excellent condition. Fenton jug with hexagonal body and with an iridescent sheen. Backstamp: Masons's Patent Ironstone China Fruit Basket England Guaranteed Detergent Proof & Acid Resisting Colours. Excellent condition. Delightful little pot with pretty finial to the cover which also has a cut out for a spoon. Backstamp: Masons Patent Ironstone China Fruit Basket England Permanent Detergent Proof Decoration. The base is crazed otherwise excellent condition. Small platter in this lovely pattern. Backstamp: Mason's Patent Ironstone China Fruit Basket Made in England Permanent Detergent Proof Decoration. Light crazing otherwise excellent condition. Lovely large round charger, great as a serving piece or just hang in on your wall and admire it! Backstamp: Mason's Ironstone Made in England Fruit Basket Permanent Detergent Proof Decoration. Excellent condition. Large oval dish with wavy rim. Backstamp: Mason's Ironstone Made in England Fruit Basket Permanent Detergent Proof Decoration. Excellent condition. This is a stunning dish in superb condition! Lovely dish with fluted rim and pattern on the inside only. 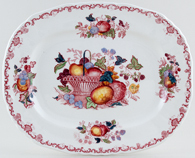 Backstamp Mason's Patent Ironstone Fruit England Guaranteed Permanent & Acid Resisting Colours. Light all over crazing with just a hint of discolouration. Round bowl with wavy rim. Pattern to inside only. Backstamp: Mason's Ironstone Made in England Fruit Basket Permanent Detergent Proof Decoration. Excellent condition. Lovely hexagonal lidded caddy. 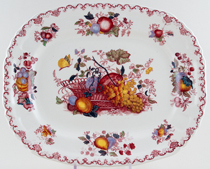 Backstamp: Masons's Patent Ironstone China Fruit Basket England Guaranteed Permanent Acid Resisting Colours. Light all over crazing and inside a little discolouration, overall excellent condition. Rectangular with concave corners. Backstamp: Masons Patentent Ironstone China Fruit Basket England. Crazed and the cover is lacking its seal, otherwise excellent condition. 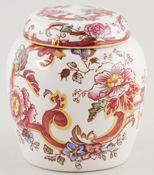 A stunning large jar with cover. Backstamp: Mason's Patent Ironstone China Fruit Basket England Permanent Detergent Proof Decoration. Excellent condition. Backstamp: Masons Patent Ironstone China Fruit Basket England. The glaze is crazed and there is a tiny nick to the rim otherwise fine. Small pot with a lid. Backstamp: Mason's Patent Ironstone China Fruit Basket England. The lid is crazed otherwise excellent condition. A small pretty box with cover. Backstamp: Masons Patent Ironstone China Fruit Basket England Guaranteed Detergent Proof & Acid Resisting Colours. A couple of lines of crazing underneath the base otherwise excellent condition. With gilt rim and gilt highlights. 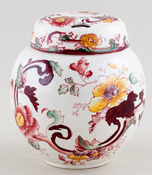 A fabulous small ginger jar. Backstamp: Mason's Ironstone Made in England Mandalay Red. Excellent condition. Fabulous jar with pierced cover. Made by Masons for Floris. Backstamp: Floris London. A few lines of crazing to the cover otherwise excellent condition.